The Farmhouse at Bowlees Holiday Cottages in Wolsingham, near Stanhope, County Durham sleeps 16 people. Bowlees Holiday Cottages near Stanhope are set on a hillside in the heart of County Durham, located a mile from the idyllic conservation village of Wolsingham in the Durham Dales. Raby Cottage (ref 27764 [Raby Cottage]), Durham Cottage (ref 27765 [Durham Cottage]), Brancepeth Cottage (ref 27766 [Brancepeth Cottage]) and Heartwell Cottage (ref UKC1473 [Heartwell Cottage]) are delightful, semi-detached properties. The Farmhouse (ref UKC3218) is detached and boasts everything a large party could ask for. Furnished to a very good standard, The Farmhouse is spacious, light and has ample facilities for up to 16 guests. There is a family suite on the ground floor which has curved walls and a high ceiling, and was previously a gin gang. There is a further suite on the first floor which has a galleried en-suite boasting a huge bath and equally impressive shower area. With a private hot tub, large lawned garden and views across the owner’s unspoilt grounds, which cover nearly 60 acres, guests may never want to leave. These holiday properties are absolutely perfect for families, walkers, cyclists and groups of friends wanting to enjoy a super holiday together. There is an on-site games room with full-size snooker table, a heated indoor swimming pool, shared hot tub and a fishing lake that can be used by guests who have booked in advance. Whether you choose to take in the scenic countryside that County Durham has to offer, or are looking for a quieter retreat, this is an ideal holiday base. Located around 30 minutes from the historic city of Durham with its World Heritage site status, cathedral and castle, guests really must take a day trip there to explore and enjoy all of the historic attractions, as well as indulging in a spot of well-earned retail therapy in one of the many boutiques. Alternatively, visitors can treat themselves to afternoon tea in one of the numerous cafés, restaurants and bistros. The National Railway Museum at Shildon, High Force Waterfall, the Metro Centre, Newcastle Airport, Durham Tees Valley Airport, Diggerland and Newcastle city centre, with its cultural attractions, are all within easy reach. Visit Hadrian’s Wall, Lake District National Park and the beautiful north east coastline. The shop, pub and restaurant are 2 miles from Bowlees Holiday Cottages near Stanhope. These properties can be booked together to sleep up to 48 people. Living room: With wood burner, 50 Freeview TV, DVD player and beams. Kitchen: With gas range, microwave, fridge, dishwasher, washing machine and tiled floor. Bedroom 1: With double bed, twin beds and en-suite with shower cubicle and toilet. Bedroom 2: With super king-size bed, twin beds and galleried en-suite with bath, shower cubicle, toilet and bidet. Bedroom 4: With double bed and en-suite toilet. Bathroom: With bath, shower cubicle, toilet and bidet. Bedroom 6: With twin beds, sloping ceiling and Velux windows. Underfloor central heating, electricity, bed linen and towels included. Wi-Fi, £5 per 2GB. Fuel for wood burner £35per week, £20 per short break. Travel cot and highchair available on request. Welcome pack. External games room with full size snooker table (shared with other properties on-site). Large lawned garden with patio and garden furniture. Gas barbecue available on request. 60-acre natural grounds (shared with other properties on-site). Two hot tubs (one private, one shared with other properties on-site). Indoor heated swimming pool (shared with other properties on-site, 9m x 5m, depth 1m-2m, open 9am-10:30pm) with shower and changing facilities. Sauna (shared with other properties on-site). Fishing on-site (licence required). Bike store. Private parking for 4 cars. No smoking. Please note: There are steps and a fenced lake in the grounds. Holidays at The Farmhouse, Bowlees Holiday Cottages run from Monday to Monday. Pets allowed at Bowlees Holiday Cottages - The Farmhouse. For a better idea of where Bowlees Holiday Cottages - The Farmhouse is, you can see Bowlees Holiday Cottages - The Farmhouse on the map below. 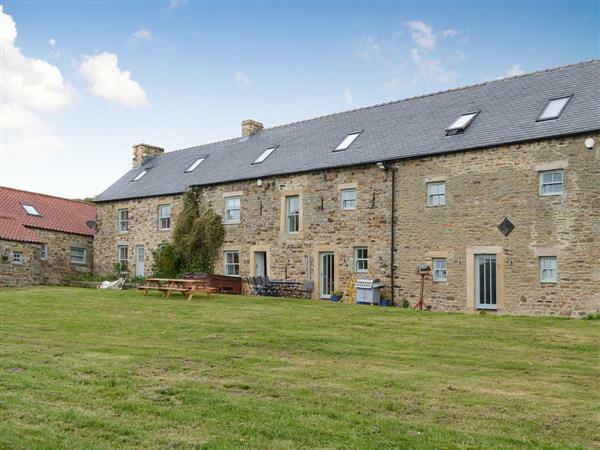 Bowlees Holiday Cottages - The Farmhouse is in Durham; should you be on the lookout for a special offer, you can find all the special offers in Durham. It's always worth checking to see what is on offer at the moment. Do you want to holiday near Bowlees Holiday Cottages - The Farmhouse (UKC3218), you can see other cottages within 25 miles of Bowlees Holiday Cottages - The Farmhouse; have a look to find your perfect holiday location.